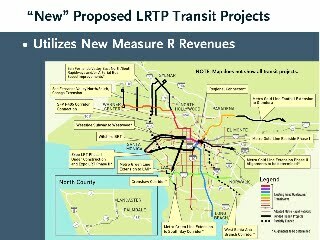 Measure R, a ½ cent sales tax increase to fund transportation improvements was approved by 68% of Los Angeles County voters. It will raise nearly $40 billion over the next 30 years and enable Los Angeles County to develop a modern public transit system. The “30/10 Plan” is a proposal led by mayor of Los Angeles Antonio Villaraigosa and Move LA, which seeks federal loans to enable our community to accelerate that development to 10 years. When LA County voters approved Measure R by nearly 68% it began an historic transformation for our community. Because nearly 70% of Measure R funds will be invested in public transit projects and services, including the Wilshire Blvd. “subway to the sea,” it will enable a transformation of Los Angeles County from an entirely auto-centered community to a community with real transportation choices, including subway, light rail, expanded bus service, as well as bicycle and pedestrian facilities. The “30/10 Plan” will see that transformation accelerated from 30 years to 10 years. The concept began not long after the passage of Measure R. Since that time Mayor Villaraigosa and Move LA have conducted a coordinated effort to build support among local constituencies and in the federal government to facilitate low cost loans that will enable these projects to be developed on an accelerated basis. This “30/10 Plan” has gained widespread support in Washington, DC, and has found a champion in Senator Barbara Boxer in addition to the support of virtually the entire Los Angeles County Congressional delegation. What will the Measure R transformation mean for Los Angeles County? What are the prospects for a successful “30/10 plan”? What do we have to do to keep it on track? These and other questions will be the topic of this presentation and discussion.